In local development server there isn't a page from where you can see your application logs. But Google has provided a handy way to do so. Add ?debug in your URL and a pop box will come listing all the logs. 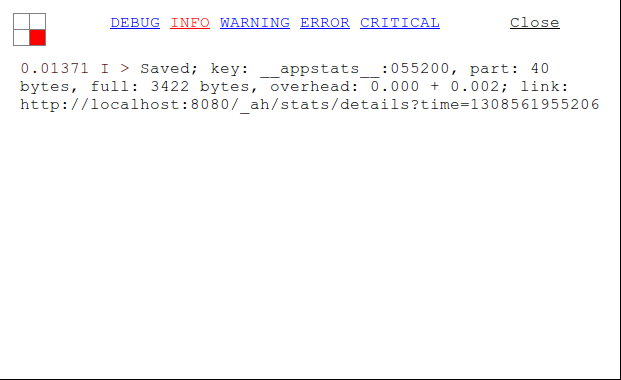 Like in appengine dashboard you can see logs by Debug, Info, Warning, Error, Critical. There isn't a way to filter the logs yet though. You can change the position of the box to top four corners by clicking in the little box on top left corner of the popped up box. Thanks.. I was looking for this for last 2 days. It always shows my index page. Please help? I have an index.htm under the root, so it's always shown up instead of the log message every time I accessed http://localhost:8080/?debug. And when I removed the index.htm, I got the error message "403 forbidden". Thanks for helping. You really don't need to type the file name in Google App Engine. Just set up the correct app.yaml. 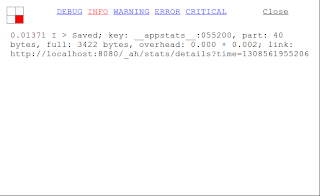 Are you sure you're running Google App Engine and not other Aache servers. Yes, i'm sure I'm using Google App Engine. what is app.yamI? I'm using the App Engine as a Maven plugin because I'm using Maven project. But, I think there is not much difference. So do you have any idea about the "403 forbidden" message? Oh sorry, i may come from Spring security i'm using.